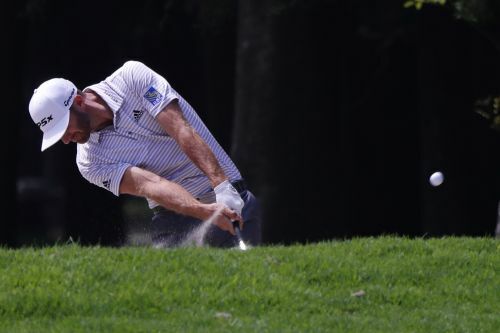 MEXICO CITY (AP) — Dustin Johnson was cruising along Saturday in the Mexico Championship until one swing put him in a bad spot, and the next shot made it even worse. One minute he was leading by six shots. Two holes later, he was leading by two. For all that went wrong, Johnson knew everything was right with his game. There was no need to panic, and he didn't. Johnson responded from his double bogey on the 10th hole with two straight birdies. He made two more birdies sandwiched around an up-and-down par from 105 yards, and he wound up with a 5-under 66 that gave him a four-shot lead over Rory McIlroy going into the final round. The 10th hole was his first score worse than par at Chapultepec Golf Club this week. McIlroy, suddenly back in the game, could not get any closer and had to settle for a 68. Johnson was at 16-under 197. No one else was closer than seven shots of the lead. He won four of them, losing a three-shot lead at Pebble in the 2010 U.S. Open, and a six-shot lead at the HSBC Champions late in 2017. Anything is possible with Johnson, and McIlroy saw that Saturday. So while McIlroy has little choice to attack in the final round, it might not be all up to him. "You can see how quickly things can change," he said. "D.J. hits it a little right on 10 and he makes double. It's easy to do that around here. So it's going to have to be a blend of aggression and patience." "It's going to take a really special day tomorrow," Reed said. "I don't think 7 under is going to get it done. I'm thinking it's going to at least take 10 (under) to maybe even a 59 depending on how he finishes the day." "D.J. is playing very well. He seems to be comfortable on this golf course. He's going to be very tough to beat," McIlroy said. "Tomorrow I'm going to have to go out there and probably shoot something similar wo what I shot the first day (63) to have a chance."